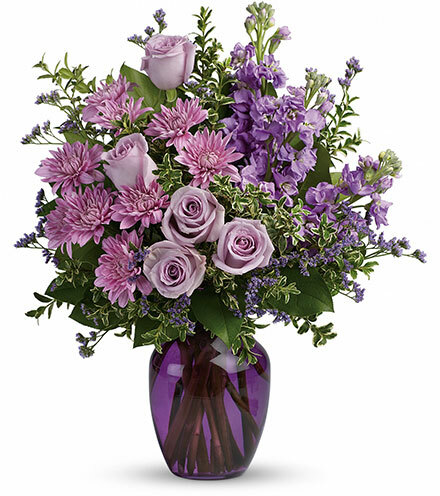 Capture the magic of togetherness with this bountiful bouquet of enchanting lavender roses. Artfully arranged in a glass vase, its twilight hues are sure to brighten anyone's day! This dramatic arrangement includes lavender roses, lavender stock, lavender cushion spray chrysanthemums, lavender limonium, oregonia and lemon leaf. Delivered in a purple glass vase.